I recently watched “Wizard of Lies”, the HBO movie about Bernie Madoff. The movie is based on the book of the same title by Diana Henriques. Unlike the book, the movie focuses on the Madoff family, not on Bernie’s crime. It’s about Bernie, Ruth, Mark and Andrew Madoff, their relationships, and the impact of Bernie’s betrayal on those relationships. To be honest, I found the movie a bit slow, uninformative, and disappointing. It’s nonetheless worth watching (if only because Robert De Niro’s Bernie is fantastic). There are obvious lessons for all to learn from the Madoff story. Know where and how your money is invested. Don’t trust a financial advisor simply because of his reputation or charisma. Investments with impressive returns may be too good to be true. There was one scene in the movie I found particularly interesting because it offers an additional, less obvious, lesson about estate and family business succession planning. The scene starts 41 minutes in. It takes place in July 2008. The market is crashing and time is running out for Bernie and his ponzi scheme. The Madoffs throw a large party on the lawn at their Montauk beach house. At the end of the party, after the guests have left, sons Mark and Andrew approach Bernie to talk. They know nothing of his ponzi scheme at this point. They are concerned about Bernie’s estate and business succession plan, of which they’ve been told nothing. Their basic question for Bernie – “What if something happens to you?” We sense that they’ve asked this before. The conversation does not go well. Bernie gets immediately angry. He assures them that Frank DiPascali, Bernie’s “assistant” and accomplice, will take care of everything. He says there are instructions in his safe deposit box. He advises them to call his attorneys. Bernie offers no answers or plans. Ruth plays no role in the conversation. Mark and Andrew walk away disappointed and angry. A lot about this conversation went wrong. Although the circumstances for the Madoffs are highly unusual, what went wrong in this scene offers a universal lesson for all. It’s not only important to have a good estate plan in place, but to be honest and forthcoming with your spouse and adult children about the plan. This is especially true for those who own a family business. Discussions about estate planning should happen in most families, but often never do. And while the conversation may be wrought with issues and emotions, they should not derail it. In addition to preparing estate plan documents, a good estate planning attorney can act as an advisor or informal mediator to help to facilitate these discussions within a family. By relying on an estate planning attorney in this way, you may be able to avoid bigger estate problems, including litigation, later. 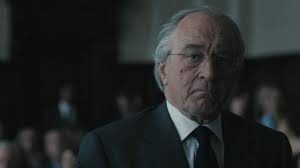 Image of Robert De Niro as Madoff from vimeo. This entry was posted in estate, estate planning, estate tax, law, probate, trusts and tagged estate planning, probate, tax, trusts on June 8, 2017 by Rachel Ziegler, Kaiser Law Group.